There is a wide variety of rubber compounds which may all look similar. However, each type of rubber is made from a unique set of composites giving each its own unique properties. There is no such thing as bad rubber; you just need to find the right rubber that best suits your needs. 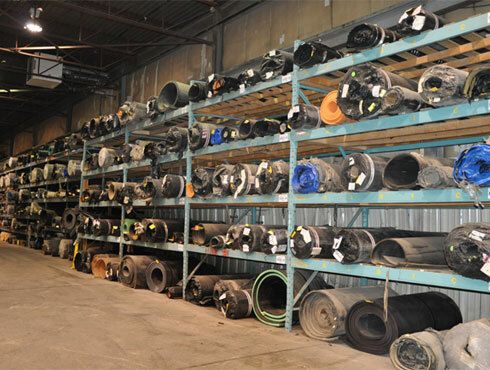 Before selecting a rubber compound, it is important to acquire certain information including the desired mechanical and physical properties and the work environment. You can quickly be overwhelmed. Over the years, Rematech has acquired the experience and knowledge to help you select the right composite. Let our specialists guide you to the right choice. Rematech offers these rubber compounds in a vast variety of thicknesses, hardness and sizes to better match your needs. Strong resistance against oils, gasoline, ozone and sunrays. Widely used in construction. Excellent resistance to heat, UV rays and ozone. Good resistance to water and water vapor; resistant against many chemicals. Possible applications: Gaskets, hosing, etc. This compound has excellent dielectric properties and good resistance to gas, and chemicals at high temperatures. Often beige-colored, this rubber has good traction and abrasion resistance. Excellent adherence to metals, good elasticity at low temperatures. Possible applications: Flexible sleeves, gasketing, steel surface covering, etc. Fabric-enforced rubber, has uniform structural resistance and good flexibility. Can be made of various rubber compounds (SBR, Neoprene, etc.) with one or more layers of fabric. Possible applications: Protective panels, mud guards, any application susceptible to receiving light or medium impacts. This rubber has excellent compressibility and good sealing properties when dry, and absorbs liquids and gases. Usually made of neoprene, this rubber is used in applications requiring low air or water absorption. It can also be made of silicone, PVC or polyethylene compounds. These sponge rubbers are also available with an adhesive backing which allows quick adhesion to various surfaces. They are available in rolls or sheets and in various thicknesses and sizes. Made from recycled materials and available in two different finishes: smooth or studded . Ideal for factories, arenas and gyms, it protects floors, and reduces vibrations and noise caused by equipment. It serves also as an economical anti-fatigue carpet. Low-cost rubber with good impact and abrasion resistance. Possible applications: conveyor skirts, etc. Also called Buna N, it offers excellent resistance to oils, fuels, alkalis and acids. Retains its properties at low and high temperatures. Possible applications: any application where the rubber will be exposed to oil or fuel; food industry (white nitrile), etc. Excellent resistance against extreme temperatures, certain chemicals and UV rays. Good resistance to fire; is self-extinguishing. Possible applications: anti-corrosion linings, parts requiring strong flame resistance, exposure to hot oils, etc. This compound resists high temperatures (450°F, 230°C) as well as ozone and humidity. Normally red or grey colour. Possible applications: Gaskets, any application requiring resistance to extreme temperatures. Designed to protect various setups against damage from impacts. Many models available; contact our Customer Service Agents for more information. Rematech offers cylindrical rope and tubes in various sizes and rubber compounds according to need.